Recently, Elon Musk announced Tesla’s plan to design and develop an all-electric semi truck, but now it looks like Mercedes-Benz might be a step ahead of him. Daimler’s new Mercedes-Benz Urban eTruck prototype is an all-electric, three-axle heavy duty truck designed for distribution and deliveries within cities. On a full charge, the Urban eTruck has an estimated range of 124 miles. The Mercedes-Benz Urban eTruck features an electrically powered rear axle and wheel-mounted electric motors, which draw power from a 212-kWh lithium-ion battery pack. Because of the additional electrical components, Mercedes-Benz claims the Urban eTruck weighs about 3,700 lbs. more than a comparable internal combustion truck. 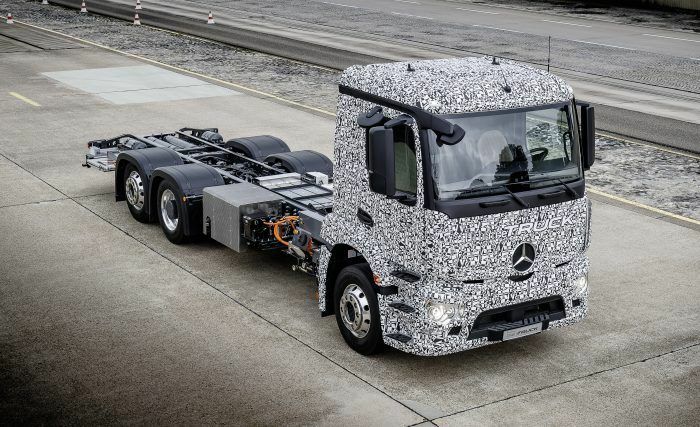 However, Mercedes-Benz claims the eTruck’s gross vehicle weight rating of 26 metric tons (approximately 57,000 lbs), is comparable to a diesel-powered truck. The Mercedes-Benz Urban eTruck does not have an onboard charger, but trucking companies could use charging stations with 100 kilowatts of power to completely charge drained batteries in two to three hours. The concept of an all-electric heavy duty truck is not new. Mack Trucks have recently been evaluating electric powered garbage trucks, which use a turbine engine to extend range, but the Urban eTruck is the next step forward because of its increased battery capacity. 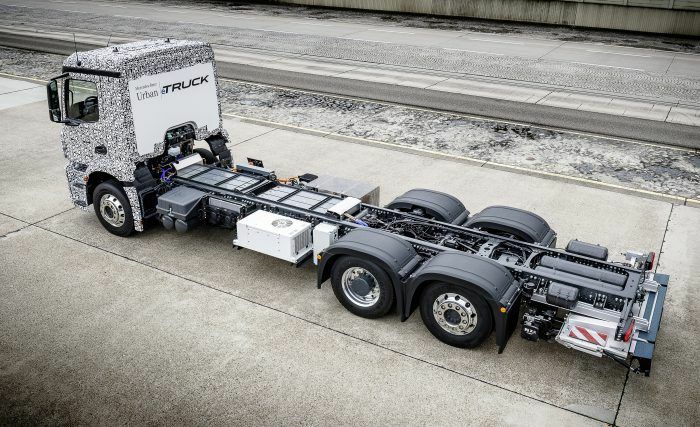 However, with a range of just 124 miles, the Urban eTruck is not yet capable of performing the long-haul trucking runs done by its conventional counterparts. Mercedes-Benz says that due to increased urbanization, stricter emissions requirements, and more advanced battery technology, it could transform this concept truck into reality within a few years. 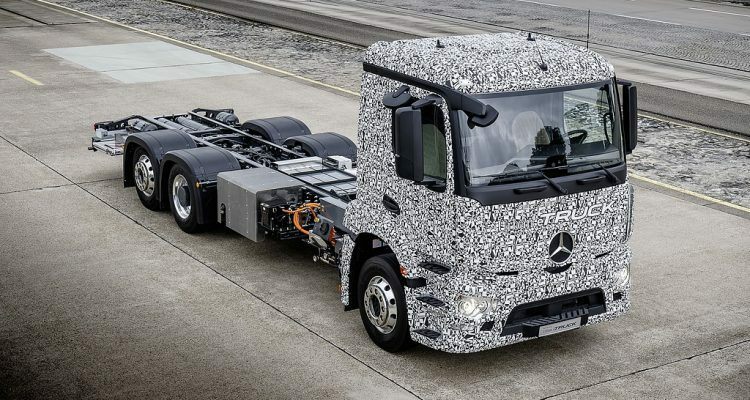 Now, its just a matter of time to see if the first production all-electric semi truck rolls out of a Mercedes-Benz or Tesla Motors assembly plant first. No Comments on "First Look: Mercedes-Benz Urban eTruck Prototype"